This bicycle has had two previous owners. George Goymour (born 1890) was the first owner and he used it until his death in 1968. It is believed that he purchased the Royal Enfield in Ross on Wye. The photo below shows George with the machine c1910. It is in exactly the same condition today. After the outbreak of war in 1914, George became a motorcycle dispatch rider in the 1st Monmouthshire Royal Engineers (7 Company). One of his duties was to convey Colonel Vaughan about the company area in a Douglas Motorcycle and sidecar. (You can see George above in his Dispatch Rider uniform). He was lucky enough to survive the war and return home to become a gentleman salesman for Atco Mowers; this employment lasted until the General Strike of 1930 when he lost his job. He subsequently did odd jobs and building work, including putting up two prefabricated houses in Dixton Close, Monmouth. During WW2 and until 1947, he worked for the Post Office on van deliveries; and, after that, sold agricultural machinery for a local firm until his retirement in 1960. He rode the Royal Enfield until the year of his death in 1968. This rare early ‘Girder’ Royal Enfield is in good all-round condition and ready to ride. The front brake is a pull-up and the rear brake is an Eadie Coaster. The ‘Riche’ model was fitted with the latest roller lever brakes whereas the normal Girder retained the earlier style of inverted levers. This version had a pull-up front brake and Eadie Coaster. 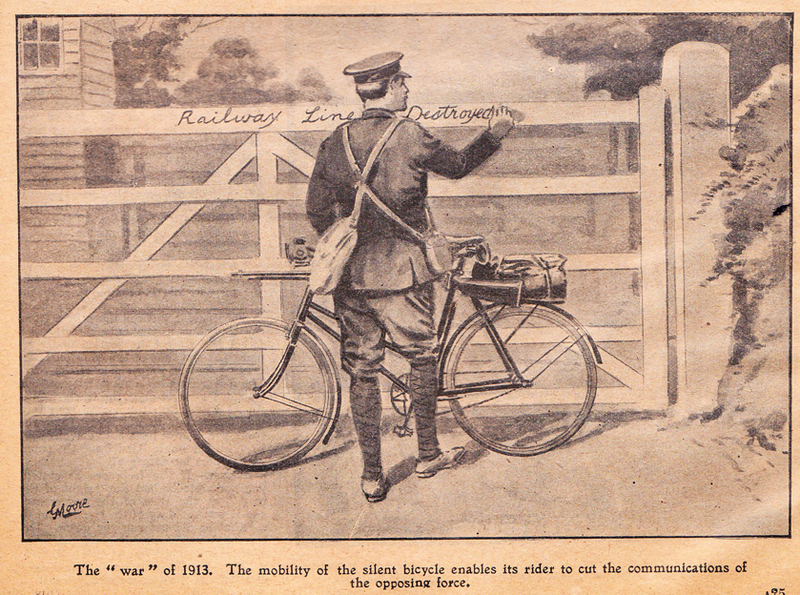 The bicycle is not only totally original, but – apart from new tyres – the machine has not been altered since the photo was taken of George with his bicycle in 1910. Even the bell is in the same location. Vintage bicycle collectors and enthusiasts often ride bikes that are the same as they were over a century ago; but, in this case, it’s enjoyable to see documentary evidence of it. The Royal Enfield Girder, in various models, was the company’s top-selling machine, and also the world’s top-selling ‘strengthened’ frame design apart from the crossframe. Royal Enfield offered two styles: The original, introduced in 1901, was the ‘Girder.’ In 1907, building on the Girder’s reputation, they brought in the ‘Duplex’ which was the original Girder frame but modified to take two struts from the seat tube to the chain stay bridge, instead of one strut. The company claimed that the Duplex had even greater strength – to justify its extra price – though it’s debatable that it made much difference in practical terms. These days, both versions of the Royal Enfield Girder enjoy cult status, for much the same reasons as they did in their day: the quirky design stands out in a crowd and, like all the company’s products, it is a well-built sturdy machine that’s a pleasure to ride. 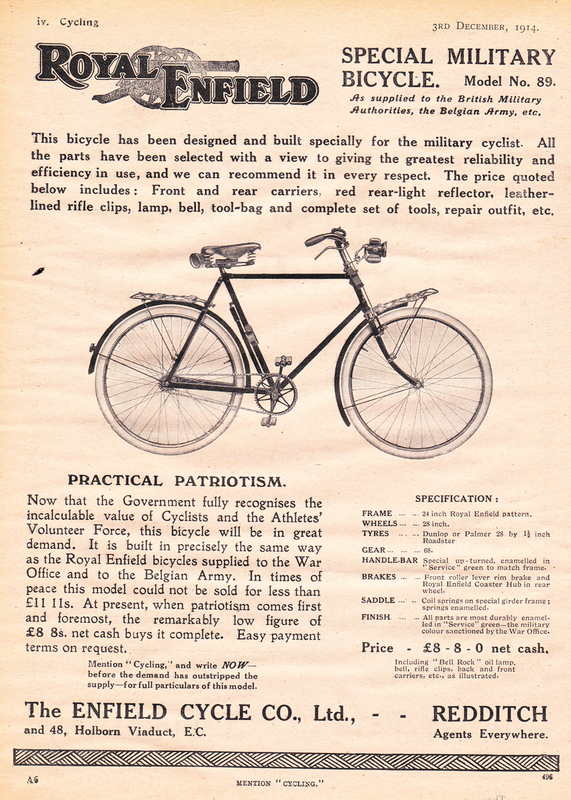 As a result of its reputation as a lightweight bicycle with a strong frame, Royal Enfield Girder Frame Roadsters were supplied as military bicycles to the War Office from 1904 onwards, and they were used in WW1 by the Belgian army. This model was also available in civilian trim when soldiers enlisted, with its price specially reduced. 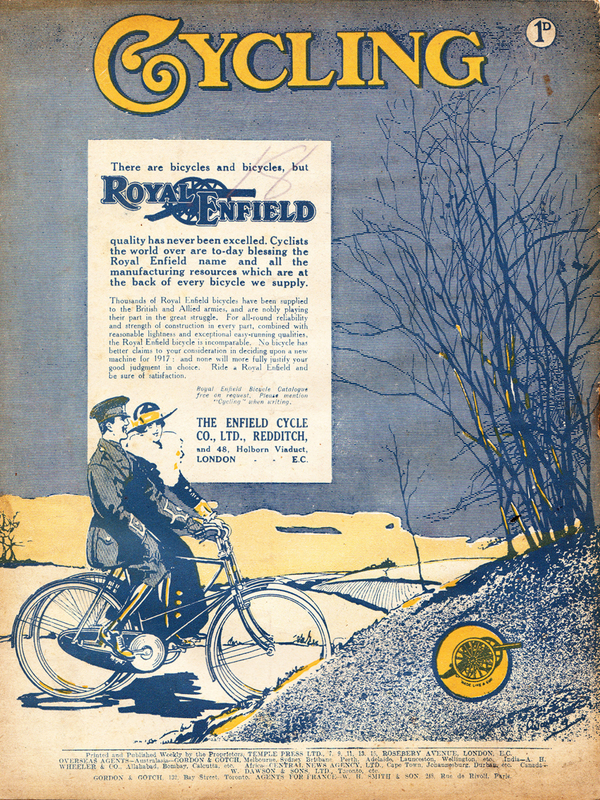 Thanks to historian Philippa Wheeler (the bicycle’s second owner) and George’s family for preserving the memory of George Goymour and the history of his Royal Enfield.